Armani Hotel Dubai is a 5-star, luxury property situated in the iconic Burj Khalifa in Dubai. Designed by the fashion icon Giorgio Armani and developed by the Emaar Group, the hotel not only oozes elegance and sophistication, but it also follows international environmental laws. Armani Hotel Dubai features 160 specially designed rooms and suites, each of which gives its guest a ‘home-away-from-home’ experience. They reflect qualities of simplicity, sophistication and elegance, which have long been associated with this world-famous fashion designer. Located at the heart of Dubai, the hotel is just minutes away from the commercial and shopping districts and gives visitors the chance to explore the city without venturing too far away from the hotel. The overall décor of the hotel is minimalist in nature, and the rooms reflect elegant simplicity, which is also the hallmark of Armani designs. The dining scene at the hotel takes a food connoisseur across the world, from Italy and Mediterranean to Japan and India. Those looking for relaxation can head to the spa, while shopaholics seeking to splash some cash can shop at Armani/Galleria, Armani/Dolci and Armani/Fiori. 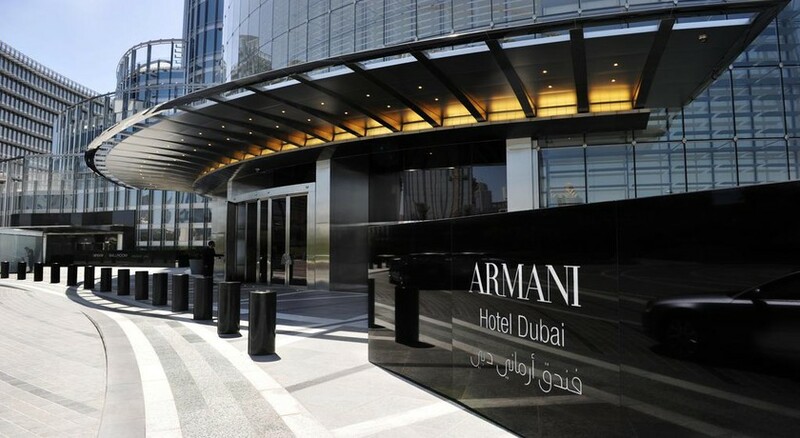 Conveniently located near the main sights in Dubai, Armani Hotel Dubai is a great base to explore this vibrant city. Set 5 km from the centre of the city, this 5-star hotel commands an excellent location and provides access to Dubai’s biggest attractions such as Burj Khalifa, The Dubai Fountain, and so on. There are in total 160 rooms overlooking the Dubai skyline that bear a personal touch of Armani. Done in shades of bronze, copper, beige and off-white, the rooms are minimalist in nature and contemporary in design and outlook. 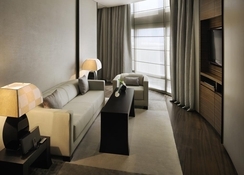 They are of three types: Armani Deluxe Room, Armani Classic Room and Armani Suites. The rooms feature king-sized beds, mini bars, 40-inch LCD TV, DVD Players, workstations, printers on request, minibars, en-suite bathrooms and a host of other features designed by Armani himself. The suites come with a personal butler station. The linen, upholstery, drapes and other fabrics have all been designed by Armani. 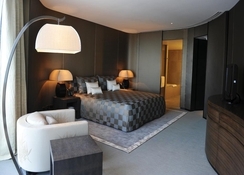 There are also one and two-bedroom luxury residences named Armani/Casa that reflects the tastes of Giorgio Armani. The restaurants of the hotel take you on a culinary journey from Japan to India to the Mediterranean. Each restaurant is dedicated to a particular type of cuisine. Hashi is the Japanese restaurant and overlooks the Dubai fountain. Ristorante serves modern interpretations of traditional Italian cuisine. Amal is the Indian restaurant that features live music and Mediterraneo is the restaurant that serves signature Mediterranean dishes. There are also a lounge bar and a deli counter. There are several ways to refresh, relax and rejuvenate in Armani hotel. The Spa features a range of beauty and wellness treatments that use Armani products. There are thermal shower rooms and a fitness centre with all the latest fitness equipment. The hotel provides a bit of a retail therapy with Armani couture, sweet and flower shops. Come night, and the hotel’s nightclub, Armani Prive, lit up to host some of the most happening parties of Dubai, featuring international DJs. Needless to say, the hotel provides bespoke packages for commercial launches, meetings and conferences. Personal and social events can also be organized. 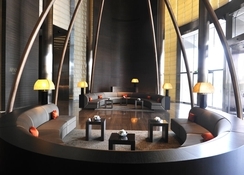 The hotel provides a list of special packages, which enable you to experience the Armani hospitality.